Click the ‘Register as a new user’ link. 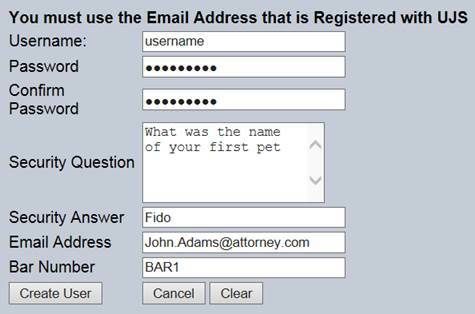 Once you have created a user, you will receive an E-mail to the account entered on the screen above. Click on ‘CLICK HERE TO ACTIVATE YOUR ACCOUNT’ to subscribe. Once you have clicked the activate link in the E-mail, be sure to click the ‘Activate Account’ button on screen. Your account will not be activated until this button is clicked. To sign in, navigate to the sign in page and type in the User Name and Password that you used to activate your account. To sign up for events, hover your mouse over the ‘Subscriptions’ link on the left hand side of the screen and select Case Events. Events are grouped into several different categories, such as Orders, Notices, Motions etc. 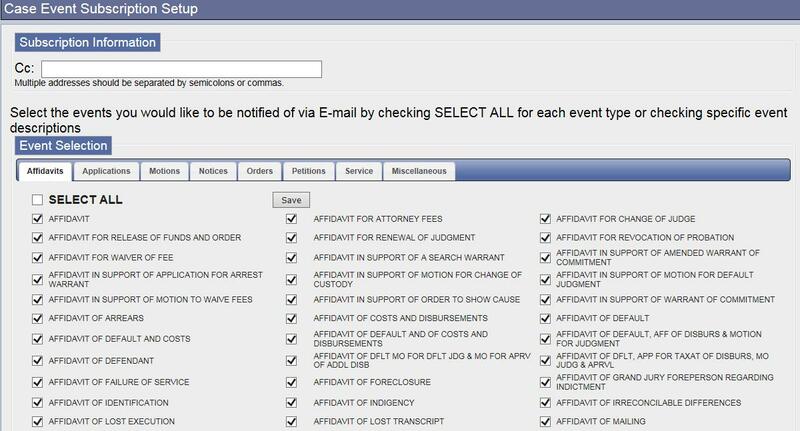 · Within each tab are listed all of the events that the clerk of courts can enter on a case. · Select the events that you wish to be notified on. Clicking ‘SELECT ALL’ will select all of the events within that tab. Click ‘Save’ at the top or bottom of each tab to save your information. You can also receive a nightly Order E-mail. 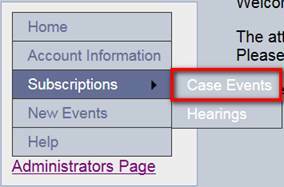 Selecting this option will provide you with an email on a nightly basis; in that email you will receive notification of any of the “Orders” events you have selected under the Case Event Subscription section. This nightly email works the same as the hourly email, you must be listed on the case as attorney of record in order to receive notification of the events. To receive this additional E-mail, go to Case Event Subscriptions. Go to the Orders tab and check Receive Nightly Orders Email and click Save. To sign up for events, hover your mouse over the ‘Subscriptions’ link on the left hand side of the screen and select Hearings. Hearings are grouped into several different categories, such as Criminal, Non-Criminal, Trials etc. 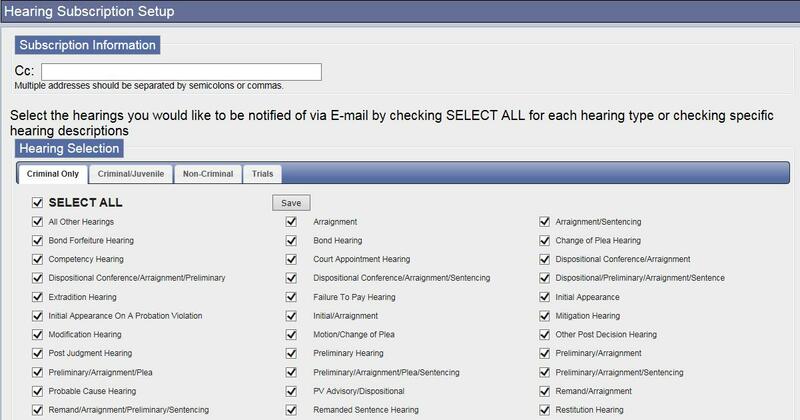 · Within each tab are listed all of the hearings that the clerk of courts can enter on a case. · Select the hearings that you wish to be notified on. Clicking ‘SELECT ALL’ will select all of the hearings within that tab. If you wish to CC someone with the notifications, include their E-mail address at the top of the screen. Multiple CC addresses must be separated by a semicolon or comma. 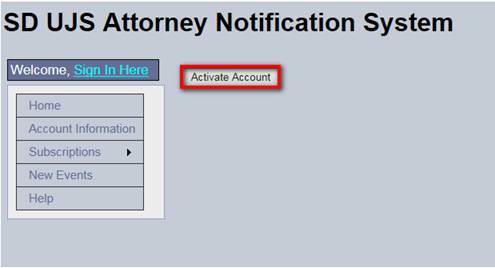 Once you have signed up for notifications, an E-mail will be sent to you when the clerk of courts adds an event/hearing to a case where you are marked as the attorney. If the clerk does not have you marked as the attorney on the case within Odyssey, you will not receive any notifications. If the clerk has you marked on a case as an attorney, you will receive notification emails unless you are removed from the case. If you feel you were added incorrectly, please contact the clerk of courts office to have yourself removed from the case. Example of the E-mail that will be received. 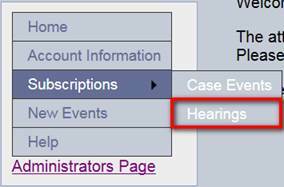 If there are more/less events or hearings that you would like to be notified for, simply add or delete the events/hearings checked within the tabs. When new events are added to Odyssey, you will be notified via email that you will need to log into your account and do a select all to include those new events. If you do not do this, you will not receive notifications for the new events added. If you are signed in, click on the ‘Account Information’ link on the left hand side of the screen. You should no longer receive E-mail from this site.